« Good food, bad food, and subversive food combining. This is such a weird and specific post. Like, I don’t think the average person would even give it a second look. But for me, it is just the epitome of truth. Like, even now I am working on a plan to discover the perfect ratio of fat/protein that doesn’t raise my sugar. I have PCOS and I’m trying to figure out how to get in that sweet spot because nothing is working. And I’ve basically come up with a formula that consists of me eating a jar of coconut oil a week, a variety of meats, and a quart of heavy cream. What sort of insanity is that? I haven’t begun it yet but I am days away. Until I read this. lol. But then it’s like what is the alternative? When working out and 30 carbs a day isn’t working for you? And metformin isn’t working? What is the alternative? Stay unhealthy and die? I just don’t know. I don’t think people realize how desperate we are. Ugh, I’m sorry, PCOS and blood sugar-related stuff can be so weird and tricky to get a handle on. But it’s also true that, depending on what metrics of health you’re targeting (blood sugar? blood pressure? cholesterol? ), sometimes a weird-looking diet will work best for you. Or not. Sometimes a weird diet in combination with other efforts doesn’t seem to do much of anything. Sometimes a particular health metric (like blood sugar or serum cholesterol) just spins out of your grasp no matter what you do, and that’s when people usually turn to medication and/or paying for professional nutrition advice. It can be really frustrating, and it’s different for everyone. All you can do, really, is to take care of yourself in the best way you know how, even if it doesn’t result in perfect control of every health measure. The best you can do is the best you can do. Kia, as another woman with PCOS, I sympathize. FYI, some research suggests that women with PCOS have a defect in insulin signaling, a missing enzyme or inability to make the right substances needed for insulin signaling from food intake (that everyone else’s bodies does automatically). All the low-carb eating in the world doesn’t fix that, only minimizes the damage a bit. Some women with PCOS have found great help with taking d-chiro-inositol or myo-inositol as a supplement, which improve insulin signaling. While more research is needed, the research on it so far is promising. I have an article summarizing the research on it on my blog if you are interested in checking that out further. 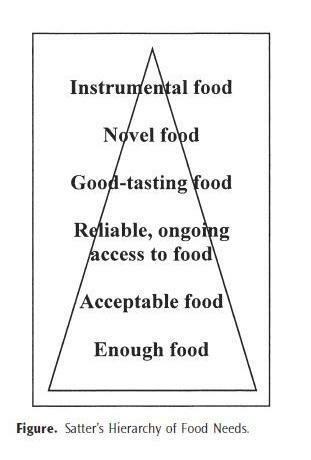 I am totally gobsmacked by Satter’s Hierarchy of Food Needs. So profound. Thank you for your compassionate work of healing, Michelle. That’s a great point, everyone needs to find their own style of eating that is nutritious and yet works for them ; enabling one to stick to healthy eating patterns long looooong term. I guess I just get tripped up when instrumental food choice experiments feel like they’re trying to solve a problem lower down in the hierarchy. For example, I’ve spent lots of time trying to play with breakfast choices because some choices result in me not want to eat for 8 hours while others have me running for a snack in 45 minutes, and nothing’s changed but the macro-nutrient ratio. It’s both a luxury that I can spend time tweaking things to that degree, but at it’s core it’s also a very basic ‘having enough food’ concern: I want to be able to feel satiated between the scheduled times I have to eat, but hungry enough that eating at the next meal time isn’t a chore or, worse, skipped. Likewise, I spend an awful lot of time trying to figure out what to eat while exercising for hours at a time. I’ve got to eat something and that something needs to a) not result in puking but b) taste good enough for me to want to eat it instead of skipping it. On the one hand, all this running around is for entirely for fun; I am literally creating this problem for myself because I can. OTOH, beyond a certain point, not eating isn’t really a viable option. My goals are never to solve the world’s nutrition problems and I honestly don’t have the best relationship with food, but I am trying to solve for things that, if fixed, would improve an actual issue I’m having. And maybe it’s a slippery slope of one small issue fixed via nutrition and then THE WORLD, but I–actually, no, I can see how that is still awfully seductive once you’ve started taking better care of the basics. If you’ve seen success in tweaking your diet to get some positive practical outcome (however you’re defining that), then what is the limit of diet changes for “greater personal good”? Diet is so individual and nutrition science is so not helpful at this point, that personal experimentation seems like the only way you’re going to answer that question for yourself if, in fact, you want the answer. Honestly, I think this kind of personal experimentation (like “what can I eat for breakfast that won’t leave me hungry in an hour”) is just part of normal eating, and part of the process. We all have to do this kind of tweaking to find out what works for us. But what I see a lot of people actually doing is trying to impose external rules on themselves that violate all of their lived experience about their eating because, supposedly, these external rules Apply To All Human People Everywhere, and by god, they are going to be one of those people even if it makes no sense for them. Sometimes, too, though, I see people engaged in purely personal experimentation but with a goal in mind of trying to achieve not just good functioning, pleasure, comfort, and general well-being, but some state of Super Health that I’m not sure even exists. I think that’s when there’s risk of it sliding into disordered eating. This is a message I really needed to hear! ~10 years ago I developed Cushing’s disease (but I didn’t know it at the time) and I started putting on 2 lbs a week with no changes to my diet. I starved myself down to 800 calories a day and ran 3-5 miles a day, and although the pace slowed, I still kept putting on weight. According to the “calories in / calories out” theory, that shouldn’t even be physically possible! I was in college at the time so I had free access to a lot of databases of scientific articles and I because obsessed with nutritional research and experimenting on myself. But the more I read, the less I knew… At one point I remember just trying to find a study that showed a correlation between being overweight and eating more calories. If eating too much makes you fat, that should be easy, right? Nope! All the studies that compared average calories per day with BMI had no difference between groups after accounting for standard deviation. I know I should give it up, but I still succumb to the self-experimentation… The problem is, doctors will always tell you that your weight, your blood sugar, your blood pressure are YOUR fault. Change your diet! You’re killing yourself! Empirically, I know that none of my diet experiments have had an affect on those things. But when you feel so out of control of your body/health, nutrition looks like a glimmering promise of a solution… even when you know it’s only a mirage. I’ve struggled with similar issues–I have chronic mental illnesses that nothing short of drugs seems able to fix (went through a year of CBT with pretty much no improvement whatsoever) and even when “well-controlled” I struggle with fatigue and just…malaise (I did recently get tested for allergies and found I have severe asymptomatic allergies which might be the cause). I’ve found looking into how our society got so obsessed with health helps a lot. Understanding why we value “health” so highly helps me to come to terms with my own body and health, and get some much-needed perspective. Two books I’ve read recently are The Happiness Industry by William Davies and The Tyranny of Health by Michael Fitzpatrick. I don’t agree with everything they write, but they have many good points and talk about things from an angle I’d never considered before. I haven’t commented before, but I have loved your blog for many moons! I work in a small store that calls itself an “eclectic grocery.” We sell a huge range of food from Hershey bars to rice protein isolate, and we don’t call ourselves a “health-food store,” but that’s how we appear to the majority of shoppers. While I’d say the majority of customers are buying fresh food they enjoy and which is delicious and fits their idea of a healthy lifestyle, it’s also kind of ground-zero for people who are eating disordered, or people who are desperately trying to sort their lives out through food–the woman who primarily ate Romaine lettuce (until a doctor persuaded her to add chicken to her diet); the young woman who tried to cure a recurrence of Hodgkin’s lymphoma with diet; the people who try to control their mood with diet (a low-histamine diet to control anxiety; no wheat because “wheat makes me angry,” etc); the zillions of people who literally panic if we don’t have the flavor of kombucha/goji berry/raw goat milk which, in their mind, keeps them SAFE. The one-miracle-food-as-savior, as health talisman, I see all the time. As long as I eat lots of (kale/pomegranate/kombucha/whatever) I am safe, I won’t get any nasty diseases, I am superior to those who eat (whatever food their particular idea demonizes). I think people are exhausted with food advice and its constant reversals and contradictions. Don’t eat fat. Eat fat. Eat THIS fat, but don’t eat THAT fat. Fat is ok, but red meat will still KILL you. Red meat is ok…if it’s raw. As an empathetic human being, I’m exhausted with food advice for myself and on the behalf of everyone scurrying to follow the latest advice they got from a health-advice columnist/doctor/naturopath/blogger/saint. I feel sympathy for people who have been disappointed that the restrictive diet of the month that they followed did not make them feel as good as they expected, and who are suffering the equivalent of a moral crisis because of it. It’s hard to be constantly told you should be eating better–you will get sick and die if you don’t do it right, and you will deserve it, is the constant message–but the more you look, the more you realize there are no hard-and-fast rules. How are you supposed to get to heaven if no one can tell you for sure what a sin is? I’m really just venting and have no whammy of a conclusion–I am tearing up, though, so this must mean a lot to me. I suspect printing copies of your blogs and handing them out to customers who appear most frightened and lost would not be at all welcome, but at least it works for ME. Thank you! Ziggy, I love your observations about food as “health talisman” and the need for safety that this satisfies. Ritual safety, magical safety – not actual physical safety, because that can never be fully guaranteed. Raw food won’t do it, more or less fat won’t do it, and following the latest food guru advice won’t do it, either. And I completely agree that it stems from this huge responsibility that society has placed on us to be in complete control of our bodies. 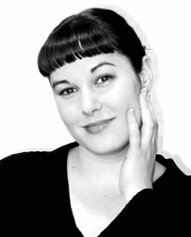 Our “sins” are visible in every bulge, every zit, every wrinkle–although it’s never quite clear what specific “sins” have caused these flaws. Admitting that we don’t actually know the Holy Truth Of Food is even more unsafe, if we believe that there is a Truth out there to be known. So yesterday I spent a couple of hours with a friend I occasionally meet with for breakfast, trying to explain this concept to her, because she’s always pushing me to go “no sugar” and “no processed foods”. Supposedly doing this will not only cause me to lose weight, but clear up my asthma as well. I tried to explain to her that these theories are not backed up by science, and even if they were, I have to eat what works for me, even if it’s not always 100% “pure”. Then this morning I got into an argument on Facebook with someone who was trying to correlate obesity with (I kid you not) membership in the NRA. I really am glad I have bookmarked your blog! Some days it’s an absolute necessity! I grew up in a household that was abusive and also pretty dysfunctional around food. There was a lot of food restriction and denial going on (e.g. sent to bed without supper often enough that I started to steal food from the kitchen and hide it in my bedroom, given the same plate of food I’d been unable to eat at the previous meal over and over again until it went mouldy and one parent threw it in the trash and lied to the other about whether I had eaten it, being told “you can’t be hungry only two hours after lunch!” when I complained of being hungry, that sort of thing), often as part of arbitrary “punishment”. I was always hungry. The evening meal was worst because usually both parents were there, and it involved boiled-to-death stuff that I found very hard to eat anyway no matter how hungry I was (I still avoid broccoli and boiled potatoes). There were a lot of other abusive things happening too, so the food stuff didn’t necessarily stand out much, it is just one thread in a rich tapestry of dysfunction. I did spend summers with a different set of parents (divorced and re-married families are complicated), where I was more or less allowed to eat as much as I wanted and snack freely, so there was some mitigation. That’s also where I learned about growing vegetables, raspberries and fresh peas and carrots were my favourites, but I was also allowed to have a say in shopping and so there were huge bags of cheetos or whatever, too. When I went back in the autumn, one of my parents would always say “You’ve grown!” and I thought it was just that kids grow more during the summer; but maybe it was also because I actually got enough to eat. I’m 35 now. I’ve had a lot of therapy, and unravelled a lot of stuff from childhood, and my friends and spouse are supportive and lovely; but it still took me until this past weekend to realise that when I am hungry for any significant period of time I get very anxious, and fearful of those around me and this might be related to how I was treated as a child. And this might also be why I tend to eat quite a lot when I do eat, even to the point of discomfort: on some level I don’t know when I’ll get another chance, or maybe I’m just replicating the re-feeding I used to do during the summer holidays. Kindof a lightbulb moment, after nearly two decades of alternating orthorexia and calorie restriction and trying to compensate with exercise for my never-quite-in-control eating habits. I’d previously heard of HAES and have felt envious of other people’s ability to just have a straightforward, uncomplicated relationship with food… but wasn’t sure it could apply to me because of PCOS, joint problems, and because I routinely eat so much. Someone linked to one of your posts and I started looking around at your archive and found old ones about permission and about regular scheduling and… I think this is what I need to do. And I ran it by my current therapist and she seemed to think it would be worth trying. So, for now: permission. All food is food and there isn’t ‘good’ or ‘bad’ food. That bit doesn’t feel quite so hard to me, maybe because it’s similar to the attitude I encountered over the summer holidays as a child. Since getting hungry seems to be an anxiety trigger for me, I’ve set myself six eating appointments per day, 2.5 or 3 hours apart so that they can be at nearly the same times every day, and if I don’t think I’m hungry I will still have one bite of food so I know I will be fed. I’ve told my spouse, our housemate, and some close friends so that they can understand what’s going on. I am only on day three of doing this, so just trying to observe what happens rather than do any serious troubleshooting yet. If it gets too hard I’ll cut back to morning appointments (breakfast, snack, lunch) and establish that before I try to regulate the rest of the day, but I’m hopeful that six appointments will be something I can stick to, say, 90% of the time. I’ll try it for at least a month, probably longer, and find out how it makes me feel. So far: I am amazed at how hard it was to convince myself to eat at one of the appointments yesterday, even though I was hungry enough that my stomach was growling (after being super-full at the previous appointment). I am amazed that it’s now about half an hour since my previous appointment ended and I am ravenous, despite having eaten a fair amount and feeling full at the end of it, as if eating reminded me that I am allowed to eat, I am allowed to have needs. I guess in some ways that’s what I’m aiming for! The difficult appointment yesterday and the one today where I’ve ended up hungry soon after are both around the same time of day as the evening meal was served in my childhood home. Maybe I can expect to have a little more difficulty with these, or maybe I just need a bigger afternoon snack. I have no idea whether this is going to work for me, but I want to thank you anyway: so much of what you tell people about deserving to eat food that makes them feel good, about having permission to eat what and as much as they want to eat, is stuff I have really needed to hear for a long time. Maybe with practice I will be able to tell myself these things and believe them. I’m so glad you’re going to try this, K! Best of luck. And yes, you are allowed to have needs, and you are allowed to eat. Unconditional permission! I would definitely expect that, since evening meal time was so scary as a kid, it’s going to continue to be somewhat difficult now. But I think with practice, you can build new associations and new memories with that time of day and that meal.